Copenhagen day 2 – Shane Stuff! Our first real touristy event was to take a walking tour. It was given to us by a guy who dressed as Hans Christian Andersen, who is something of a national hero in Denmark. Statues bearing his likeness and name adorn many of the parks in Copenhagen. Throughout the tour, “H.C.” as he’s known around the city, stayed in character, pointing out sites along the way that likely influenced bits his writing. Have you ever heard the story of the old Street Lamp? It’s really not very amusing, but you might listen to it for once. We started off at the City Hall Square (“Rådhuspladsen”) which we had visited the previous evening, and he gave us a brief overview of Danish history as a peoples, starting with the Vikings and then moving up through the modern era of the peace-loving folks we find now occupying the city hall. We continued down to the City Court of Copenhagen as H.C. recounted history of government in Copenhagen and was really exhaustive and fun in doing so. It helps that many of the statues, buildings, and obelisks around the city are dated (typically either in Latin or modern Danish but with Latin spellings) and many of them have reliefs to tell the historic story. Interestingly, when I went back through to review the photos and translate the original Latin found on some of these monuments, I found discrepancies between the dates on them and the dates in other places like Wikipedia articles (at least the ones in English). Often they were discrepancies in things like completion dates, so I suspect this is just another time when “the definition of done” (as we often refer to in software development) may have been a bit ambiguous. Even software has century-old problems; history does, indeed, repeat itself! We continued down to the Church of Our Lady, which is a beautiful church with a wonderful marble Christus statue inside. Church of Our Lady interior. The apostles line the outside, but the designer decided to omit Judas Iscariot (the betrayer) and substitute a statue of St. Paul in his stead. We figured out abortion, gay marriage, health care, gun laws, capital punishment, women in the work force, and warfare decades ago, and at this point, there’s really no debate left in the country as to whether the decisions were right or not. The only thing we really haven’t figured out yet is immigration, which is still a hot topic. Anyway, we moved out of the church which was adjacent to the Niels Bohr Institute… an interesting meld of church literally right next door to science. We went on to talk about Nazism and post-Nazism in Denmark, particularly the modern economy, which is almost entirely service-based with very little reliance on natural resources. As a result of this “human reliance,” Denmark makes sure that all of its people are extremely well educated and happy workers in the workforce. This, to the extent that if convicted of a crime, many prisoners are granted and encouraged leave of the prison on a frequent basis for educational programs (or educated directly via the prison system). I know some people I’d talk to in the US would say “that would never work,” but only 71/100,000 people in Denmark are in prison (compared to over 10x that in the US at 731/100,000) and with a lower overall crime rate than the US. And people are much happier in Denmark to boot according to polls. We ended our tour near the Round Tower, which is an appropriate end to this tour as it combines government, education, science, and religion. Additional photos of our walking tour along with descriptions can be found by clicking here. After our H.C. Andersen walking tour ended around noon, we decided to continue walking to get to some of the other sights. We headed off to the Rosenborg Castle. The castle is surrounded by a large garden, which is neatly kept. The castle is guarded by 2 large bronze lion statues, a moat, and the Royal Life Guards, a regiment of the Danish Army. The inside hosts the Crown Jewels and Crown Regalia, which we decided to skip past for a shortage of time. The linked words contain photos and additional photos along with descriptions can be found by clicking here. As we were leaving the the Rosenborg gardens and starting to get hungry, we decided it would be wise to work our way toward the famed “Mermaid Statue” (more on that later). This took us past a large church known as the Marble Church. Rick Steves and friends of friends hadn’t mentioned it at all, which in retrospect was a big mistake! We saw they were doing a tour at 1pm, and given it was 5 minutes to, we sprung for it. The inside is painted wonderfully and has pipe organs and inlays throughout. We were greeted by a sprightly man who was apparently (one of?) the sexton(s). We were taken up very thin spiral staircase with not so much as a handrail and then led up to some stairs which really looked like they shouldn’t have been anything more than temporary scaffolding. That, in turn, then led up to the domed entry. There were a few elderly folks coming with us and I was terrified that one of them was going to slip and create a human avalanche with plenty of broken limbs for that Danish health care system to attend to. Once out on the top, as with the interior, boards whimpered with almost every step. It didn’t help ease my mind when the sexton mentioned some bits about earthquake analysis requiring some retrofitting. But in any case, we were there and holy cow what a view! Amalienborg: the winter home of the Danish royal family. On the horizon in the right side of the image, you can see a piece of a bridge, which leads to Sweden. You could see the tops of just about every building in Copenhagen and even out to Sweden. It was great to get this aerial view which helped settle in where we had been during the day and simultaneously where we were planning to go the rest of the day. The sexton gave us a really great and really energetic overview and history of the building and some of the other buildings that we could see. We were told that this was the third largest church dome in Europe. Neat! There are a lot of additional photos from the dome, along with descriptions of the buildings and public spaces which are seen from this vantage. These can be found by clicking here. After leaving the Marble Church, we headed toward the Little Mermaid, a bronze statue by Eriksen, stopping first to grab lunch at a wonderful cafe and get some Smørrebrød — a sort of open faced sandwich special to Denmark. We walked through Kastellet, a star-shaped fortress built in 1662 and still actively patrolled by the military, though it is used as much (perhaps more) as a public park as a military installation. Just outside the Kastellet is St. Alban’s Church, which is next to the Gefion Fountain seen above. The Gefion Fountain is another reminder of the norse history of Denmark. Gefjun is the Norse goddess associated with agriculture, which is why you see her driving oxen at the top of the fountain and why water is pouring forth. Finally, we ended up at the Little Mermaid statue, and I have to say I was unimpressed by anything other than by how many people seemed to find it fascinating. Ok, so we saw it. I took a picture of it. It’s still there. And with that necessity fulfilled, it was time to move off to more interesting bits. 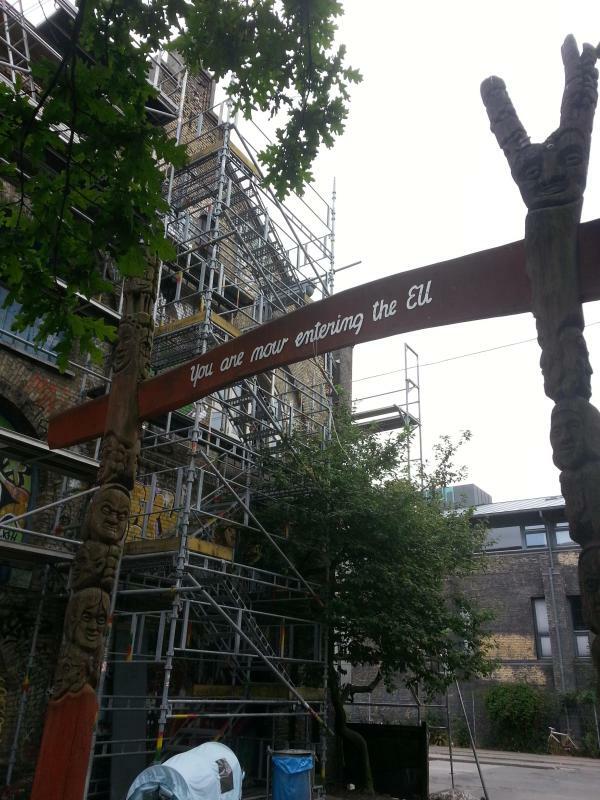 Namely, Christiania. We took a ferry from near where the Little Mermaid statue was to Nyhavn (one of the administrative districts in Copenhagen). The captain of the boat was oddly reluctant to take our money. Indeed, just about anybody that boarded seemed to get a nonchalant shrug. We managed to convince him to take our money and got off at Nyhavn, which sits right on the water and acts as a sort of mini-harbor where many of the tour boats leave. 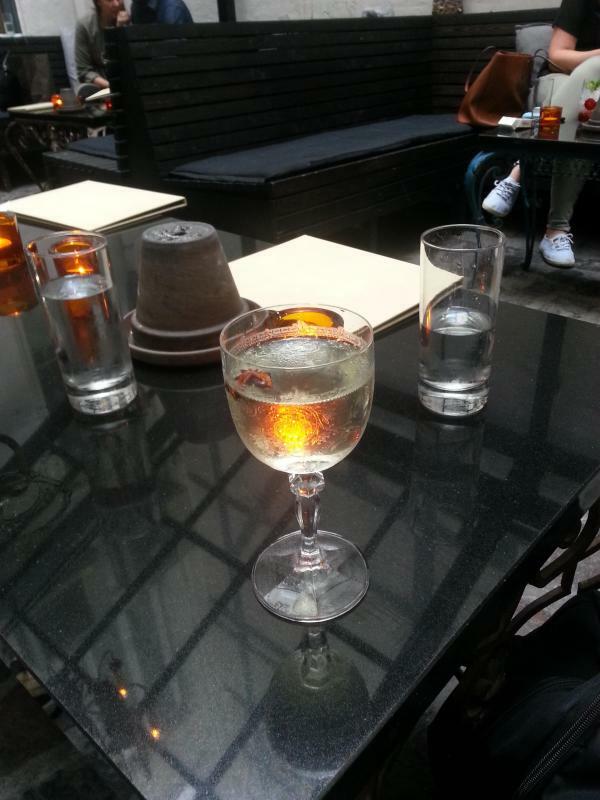 We had heard that there was no open container law in Copenhagen and indeed the drinks were out in full force. Kem and I didn’t want to feel left out, so we stopped in a corner store and crabbed a couple beers and partook with some street musicians playing nearby. 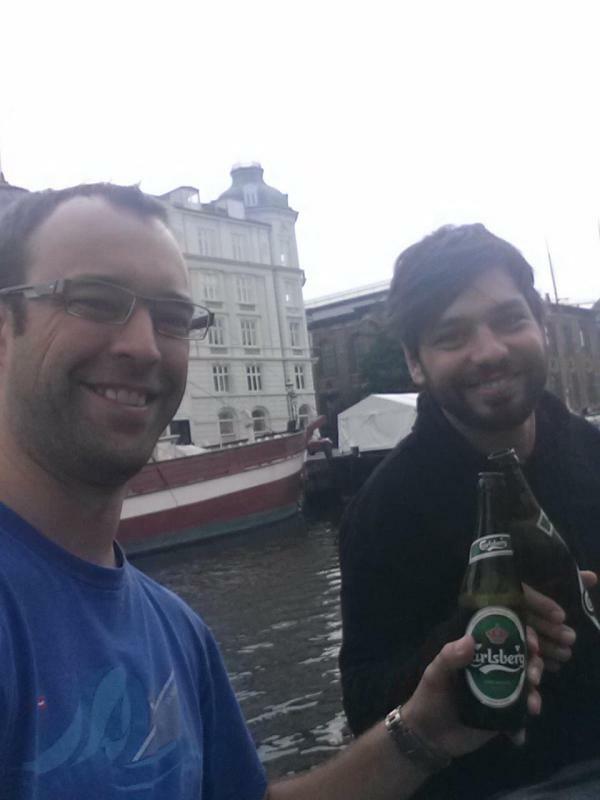 When in Copenhagen, drink a Carlsberg by the water with the locals! After fully sated, we moved to Christiania. 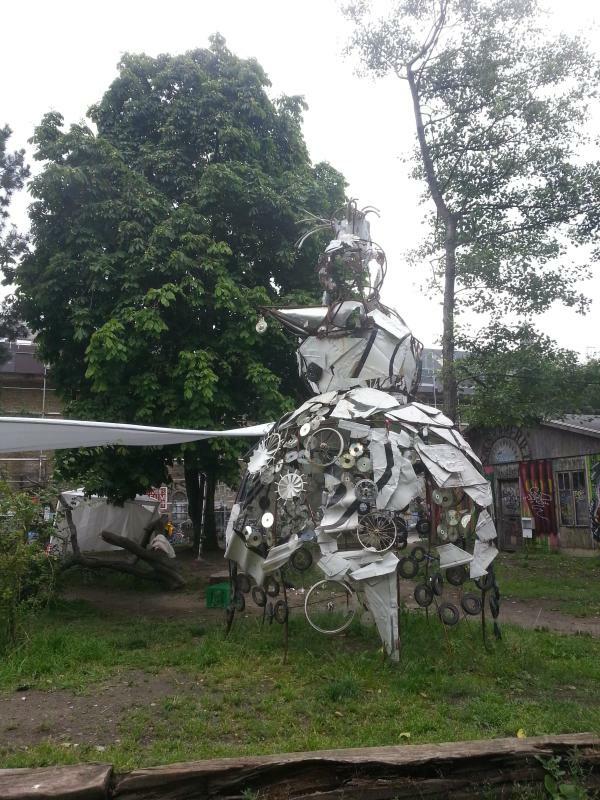 Christiania is an interesting self-proclaimed autonomous region of Copenhagen. It used to be a military complex, but since the military left the island, it’s ruled by what sort of amounts to elders which see to it that the place is both interesting and has the ability to maintain its self-governance. It seems like a sort of permanent Burning Man with better weather and easier access to the rest of humanity. 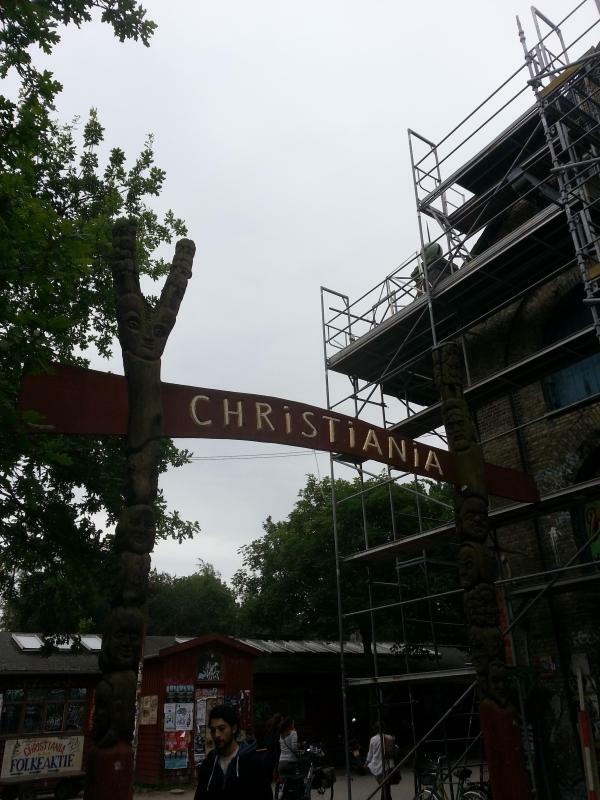 I don’t have many photos of Christiania, as much of it has one additional rule: no photography. This is imposed because even though Christiania may have these self-imposed laws, there’s little other than public distaste for it to keep mainland-Copenhagen police from coming into the area and arresting for otherwise illegal activities. At the end of the day, we had one last thing to see: Christiansborg Palace. This is the primary location of Parliament, Prime Minister, and Supreme Court of Denmark. Christiansborg Palace was unfortunately closed for the day by the time we arrived. Even though the building was closed and was fairly quiet, I got a few photos before my camera started flashing that it was about to drop dead of battery. It is quite an impressive building from the outside! Finally, somebody had given us the recommendation to stop in at Ruby, an inconspicuous cocktail bar on our way back to our hotel. I had their Heather Martini, pictured below, and a “Summer and Ale” which was a neat gin drink made with jasmine tea, Cynar, elderflower, lemon, and then topped with Mikkeller IPA. As we had experienced with the rest of the Copenhagen food and drink scene, both drinks were fantastic, though pricey: the 4 drinks between the two of us added up to over $90 USD. We wrapped up the evening with some dinner at a British style restaurant and then moved to catch some live music. As we were listening and having a beer, a couple looked like they were trying to find a seat, so I offered the 2 remaining seats at our table to them. We shared some drinks, stories, and laughs with them: a great way to round out the city with some locals.